Sometimes, in the course of our lives, we encounter a person, a moment or an experience that changes our life trajectory. For 37-year-old Jill Baker, that experience was actually a place – Hutton House, Center for Human Services’ temporary housing program in Modesto for teenagers facing homelessness or crises. Between the ages of 13 and 16, Jill was in and out of Hutton House countless times. “I went back time and time again because it really was my safe place and I knew that I was going to get the things that I needed and most desperately wanted – someone to talk to, someone to listen to me, someone to give me a set of boundaries and tell me that, not only would it get better, but that someday maybe my family would be more connected,” Jill recalled. Her parents worked many hours and were hardly ever home, and her older sister moved out at 15 years old, leaving Jill to fend for herself. She sought attention by using drugs and alcohol and running away from home. 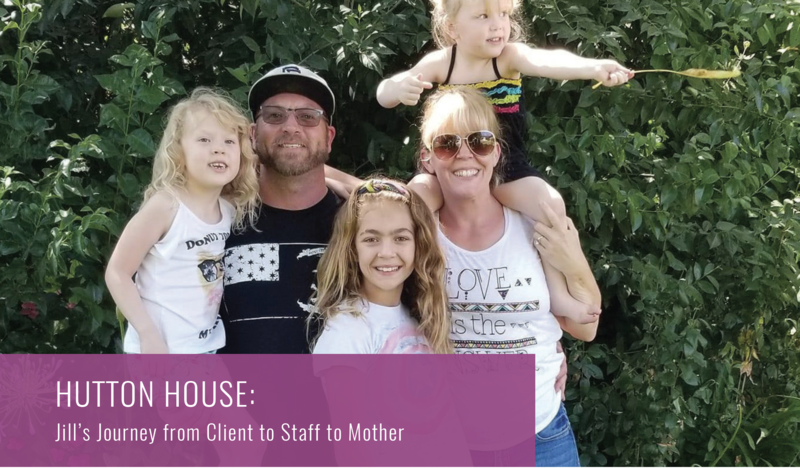 Jill’s parents took her to Hutton House the first time and they received family counseling to learn different tools to help them connect better, but it was a temporary fix. Jill returned to Hutton House many times after that – sometimes on her own in the middle of the night; other times her parents or the police took her there. Hutton House Program Manager Valrie Thompson worked with Jill and her family 24 years ago. After three years of stints at Hutton House, couch surfing with friends, and getting deeper into trouble, Jill’s parents and Hutton House staff knew they had to find a more permanent solution. At 16 years old, Jill moved to Oregon to live with her grandparents. She earned her high school diploma at a continuation school there and returned to California when she was 18. After 10 years in the Bay Area where she had her first daughter, Jill, her husband and her baby moved back to Modesto in 2008. She didn’t have a job, so she returned to the one place in Modesto she considered home – Hutton House, first as a volunteer, then as an employee. Jill worked at Hutton House for five years, providing hope, mentorship and delicious meals to dozens of teenagers. She now manages a local restaurant, is pursuing her dream of having her own catering business, has rebuilt her relationship with her mother, and is raising three daughters. She says Hutton House saved her life and, in turn, molded her into the consistent and reliable mother she is today.